All counselors live in a cabin with 2-3 other counselors and 10-15 campers. 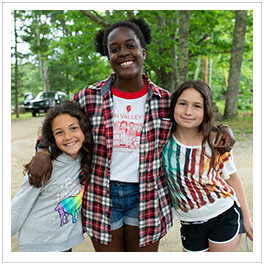 Cabin life focuses on creating a community with a diverse group of campers, fostering individual growth, and maintaining a supportive and enlivening cabin "family." Counselors also teach 4 periods each day in a variety of program areas. 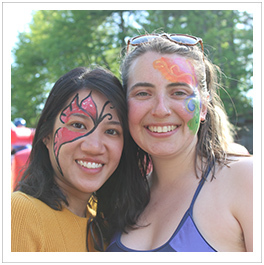 Details of program areas and responsibilities are available by reviewing all of the specific job opportunities at Hidden Valley. At Hidden Valley, training and supporting staff are critical elements to our success. Find out more about how we train our staff here. HVC is an amazing place for both children and adults to spend their summer...You helped me feel comfortable, supported and welcome. 17-Day Staff training includes certifications, counseling and teacher training and bonding for this diverse staff group.